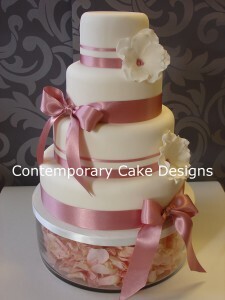 This beautifully dressed pink ribbon 4 teir wedding cake, is just one of the latest creations produced by Contemporary Cake Designs. The ribbon colour can be easily changed to match your own wedding colour scheme. The cakes stature and size is sure to grab your guests attention and keep them commenting on your wonderful centre-piece.